Joshua Burnside confessed he hadn’t set up during the interval between his set and previous act, Once There was King. So, he and Dan Byrne-McCullough found themselves tuning and clicking and plugging in their guitars for the first few moments of their show. We didn’t mind. The soon to follow rendition of “Grapes” was gentle and layered, funny, mysterious and lovely. “I don’t understand why people bring you grapes when you’re not well/I don’t think I’ve ever liked them since” he sang to soft laughter from the quiet room. The unexpected stream of thought hooking us into the story behind the words, setting us into the scenes painted by the two guitars. The songs that followed were drawn from his various EPs and his 2017 album Ephrata. They shifted the silent, seated, well-filled room between his worlds. Sometimes shrouded and unclear, on other occasions frank and practical and musing. In “Holllllogram” he captured the two-dimensional connections we make, or keep up, through social media. “So love glows like the moon/Swinging low above the Atlantic/I fell for a hologram/I don't give a damn/If I have to dance alone I will.” The mood of the song was brought down to earth, away from the screen and back onto the street, with the trumpet of Sarah Martin. Grounding it, making it feel familiar, helping it connect with all three dimensions. He wrote it in protest against that very special passion that some people have here of shrouding our streets in unwanted flags. The song was melodic, evenly and unfalteringly sung, the essence of a ballad. No stomping or shouting, just a bloke who wants his lamp posts back. Managing at the same time to be ballsy and low key. Fair play Joshua Burnside, this whole performance was a showcase in understated talent. As mentioned earlier, Burnside’s support for the night was Irish three-piece, Once There Was A King (OTWAK). They came to light after Ray Giffen, the manager here at The Duncairn, saw them at Body & Soul during the summer. 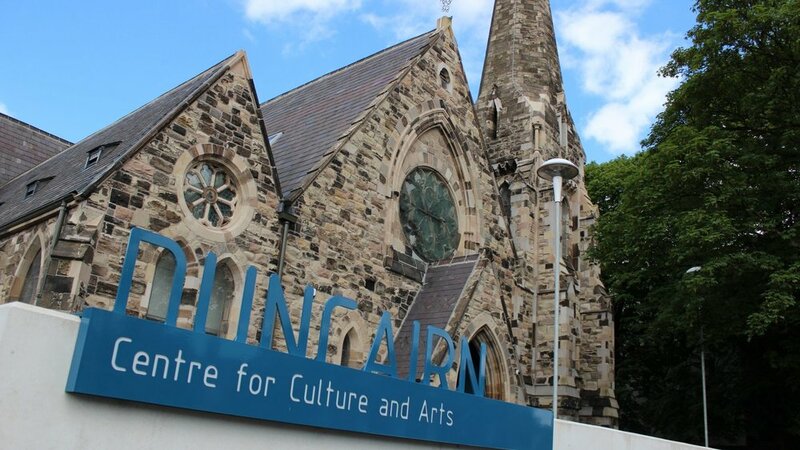 But there’s a chance you may have seen OTWAK’s John Flynn, Ultan O’Brien and Patrick Cummins before at The Duncairn as part of Skipper’s Alley. Once There Was A King is different though. Described as “spontaneous and improvisatory by nature,” their traditional roots are bent into different shape with a very distinct improv attitude. Exacting, and at the same time free to roam wherever it bloody wants, the sound of this band on Friday night managed to feel familiar but unsettling. They were true to the spirit of the music while similarly kicking the tables over - with a hypnotised growl of a left foot. And genuinely, it’s been a while since I’ve seen a new band and realised I’m excited about what I’m hearing. They opened with a tune based on “Fair Haired Molly,” but “it goes somewhere else,” we were advised. Cummins’ pulsing banjo led the pace while O’Brien’s fiddle was a stretched passing train. In the long intro of floating scenes there was disembodied, fade-in, fade-out whistling and the yap yap of a distant dog, before the groaning gutterals started. The tune/atmosphere ended up feeling like it was becoming manic, but it never quite slipped. And all the while the music continued. I missed the intro to the next number apart from the line: “A warning to all fair maidens, but sure go for it if you want to.” John Flynn this time was singing. His voice ringing with the air of a deep discordant Sam Amidon. And as the banjo was intermittently plucking and scraping, tinny clanking, with dissenting and agreeing notes, that voice, Flynn’s voice, was aching. O’Brien’s fiddle felt ancient here. Ancient and expansively sad as it told the story with rhythms and screams everchanging from heart pumping to heart breaking. Then over to Flynn’s voice. The monstrous, agonised groaning: “How dark and dismal are my days.” This performance was extraordinary. Music journo and member of Duncairn’s crack team of volunteers! Get the latest news, pre-sale ticket access and discount codes by signing up to our newsletter.